If you own a yoga, gym, or fitness studio — or if you are a personal trainer — and are looking for ways to attract and keep more clients for your yoga / fitness classes/services, I believe you’ll be interested in seeing how this Facebook ad campaign generated more than 170 leads and nearly $14,000 in additional new revenue in just two weeks for a local family-owned yoga studio. As you can see from the video below, the owners of this Haymarket, Virginia yoga studio were thrilled with the number of new clients they brought into their studio from their first-ever Facebook ad campaign. Transform Power Yoga had been spending more than $1,000 per print ad in a local community magazine — that was bringing in only 1-2 new clients per month (at best). Facebook is one of the most affordable and effective advertising channels available to small businesses today. There are more than 174 million active Facebook and Instagram users in the United States alone, and you can target your ads to reach the most relevant segment of this population — at a fraction of what it typically costs to advertise in your local newspaper, magazine, billboards, radio or Google. Through Facebook’s power editor, we can see that there are currently 27 million people ages 18 – 65+ with an interest in yoga who live in the United States. The more money you budget for ad spend, the more people you can reach. For this campaign, we determined that we could reach an estimated 1,800 – 4,800 people per day with a $20 daily ad budget. 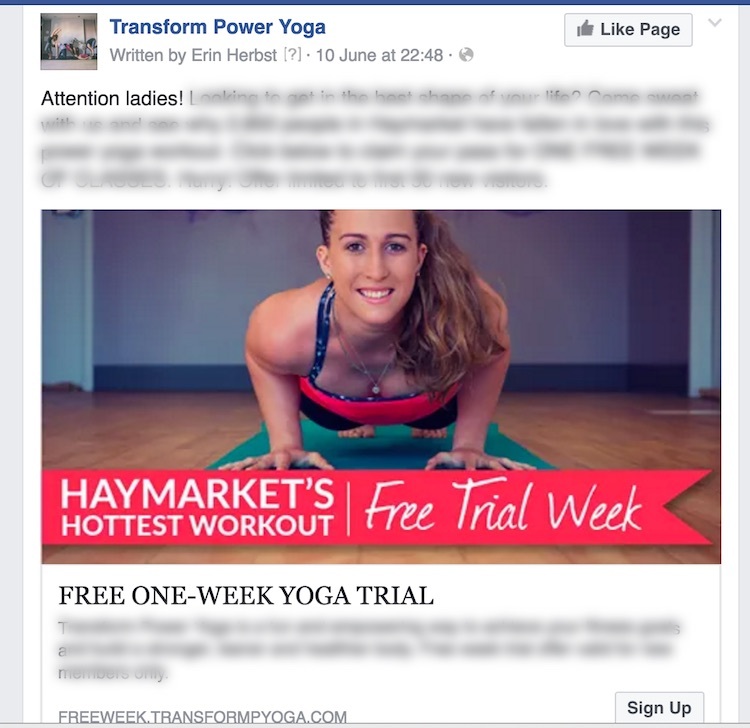 For Transform Power Yoga, we wanted to keep costs down by showing our ad only to a local audience of women living within 10 miles of the studio who had an interest in yoga and fitness. We selected women only for this first campaign because women tend to be the most responsive to these kinds of ads. An irresistible “no brainer” offer targeted to the people you most want to attract into your business is the single most important factor in your ad’s success. Many business owners resist this essential step. They are afraid to offer steep discounts — or freebies — because they think it will lower their perceived value and people will take advantage of them. The important thing to keep in mind here is that if you aren’t bringing people through your doors so they can experience your yoga classes (or fitness training) you will never get the opportunity to enroll them as long-term clients. That’s why we always recommend free trials or a minimum 50% discount offer when advertising on Facebook, as these are the kinds of offers that attract attention and generate leads that you can convert into long-term paying clients. If possible, get a professional quality action photo of a class in session, the studio itself or an instructor for your ad. In this case, we took a photo of one of the studio instructors (see image at the top of this page). Once the ad image is uploaded into your Facebook ads manager, you need to write and upload the ad copy. Once you’ve attracted the attention of your Facebook audience with your eye-catching ad, you need to have a special one-page website — called a “landing page” — set up to capture the contact information and repeat your special offer. You never want to send people from your ad to your website because websites are not designed to convert visitors to leads right away. You also want to make sure the phone number on the landing page is a special call tracking phone number (not your regular in-house phone number) — so you have a clear way to track the number of calls generated by your ad campaign. How to set up a call tracking phone number is outside the scope of this article. If you would like more information on how to do this, let me know and I will explain further. Landing pages are designed with one goal in mind: To get the prospect to provide their contact information in exchange for the special offer you’ll be sending them. The Thank You Page is where your prospect gets the coupon code, downloadable coupon, or other instructions on how to redeem their special offer. It’s also an opportunity to make an additional offer in exchange for prompt action. If we were to do this again, we would offer leads a free Transform Power Yoga t-shirt in they called immediately to schedule their first class. This would give each lead a reason / motivation to pick up the phone and call the studio right away … and offers the studio another advertising channel by giving their own prospects a branded t-shirt that can help spread the word and increase visibility in the local community. We connected the landing page opt-in form (the form used to collect the person’s name, email address, phone number, etc.) to the studio’s Constant Contact email account, so that all leads’ contact information would be automatically entered into the Constant Contact database. The value of this step is that it helps the studio build its own list of prospects to whom they can continue to market indefinitely, without incurring additional advertising costs. Building up your email list is a valuable asset that can increase the overall value of your business if and when you decide to sell it in the future, as well. Step 8: Write and Schedule a Series of Automated Follow Up Text Messages and Email Messages for People Who Sign Up for the Special Offer. Constant Contact and other email service providers offer “autoresponder” features that allow you to prewrite and preschedule a series of promotional messages that can be sent out at specified intervals after someone has been added to your email list. In this case, we wrote a series of emails that went out daily for several days after the lead was added to the Constant Contact database, reminding them to visit the studio’s website and enroll in their 7-day free trial before it expired. One of the many advantages of advertising on Facebook is that you are in total control of your ad budget. You can increase your ad spend or decrease it according to your goals, and even pause the ad completely if you start getting more leads than you can handle. We set an ad budget of $20 per day for two weeks and generated plenty of quality leads for the ad spend. Once all the above steps are completed, you are ready to “go live” with your ad. We saw leads coming in within 24 hours of launching this campaign. Transform Power Yoga expects to generate nearly $14,000 in additional revenue just by enrolling the 9 people who signed up for the introductory month into ongoing monthly classes for a year. With a 96% retention rate for all students, it is highly likely they will attain this goal. The actual revenue boost is expected to be much higher from this campaign alone, as additional free trial subscribers come into the studio, try the classes and enroll in the ongoing monthly plan. And the studio will continue reaching those who did not come in via ongoing email messages to stay top of mind. Experience proves that email marketing is effective at bringing more customers and clients into any business. It is vitally important that you call each new lead ASAP once you are notified that they have signed up for your special offer. People are busy with work and family. They get distracted and can easily forget to follow through to redeem your special offer — despite their best intentions. We had to be persistent in calling and following up to maximize the results for this campaign. This took more time than we anticipated — so we advise that you prepare in advance. We recommend you have a dedicated staff member ready to call and follow up with leads from your Facebook campaign. If you don’t have this resource in place in advance, you will definitely lose out on the opportunity to turn your leads into happy long-term paying clients. Would You Like Expert Help in Setting Up Your Own Facebook Ad Campaign? This article provides the highlights of setting up effective Facebook ad campaigns, but by no means covers all the steps or elements involved. It’s not easy or simple to set up a Facebook campaign that works as well as this one did.